Scotsman.com is reporting that a Scottish court heard on Friday (Jan. 7) that there was little or no comparison between the death of a local schoolgirl (photo) and the murder of a would-be Hollywood actress in 1947 that served as the basis for paintings by shock-rocker MARILYN MANSON. The High Court in Edinburgh has heard that Jodi Jones's boyfriend, Luke Mitchell, 16, was a fan of the rock star MARILYN MANSON, and that MANSON published on his web site a series of watercolors he had painted depicting the murder of Elizabeth Short in 1947. In what became known as the Black Dahlia killing, the would-be actress's body was cut in half at the stomach. Professor Anthony Busuttil, 59, the pathologist who carried out a post mortem examination on Jodi's body on July 1, 2003, said it was possible the girl had suffered some form of strangulation, by hand or a ligature, which rendered her unconscious before an estimated 12 to 20 cuts were inflicted to the throat. The 14-year-old's carotid artery had been almost severed, and the jugular vein was cut through entirely, resulting in virtually immediate death. Busuttil added that the body had then been mutilated, with wounds to the breast, stomach, face and arm. A knife had also been pushed into her mouth, piercing her tonsil. The defense counsel, Donald Findlay, QC, referred to the murder of Elizabeth Short and the MANSON paintings. He said that, unlike the present case, the victim had been sexually assaulted, tortured, cut in two, drained of blood, washed, and her mouth cut extensively at each corner to look like a grotesque grin. Findlay continued: "Bizarre as it may seem, if anyone were to suggest that what happened to Jodi Jones was done to replicate the injuries on Elizabeth Short, as portrayed by MARILYN MANSON, that bears no scrutiny at all." 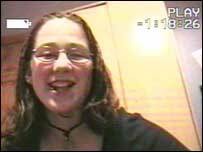 Luke Mitchell denies murdering Jodi on June 30, 2003 at a wooded area near Roan's Dyke in Dalkeith.